Manchester United are reportedly growing confident of committing David de Gea to a new long-term contract. The Spaniard had a rather average start to the season but his form has improved alongside United's in recent weeks. According to Metro, United are becoming increasingly confident of extending the Spaniard's contract amid the change in mood since Ole Gunnar Solskjaer took temporary charge at the helm. 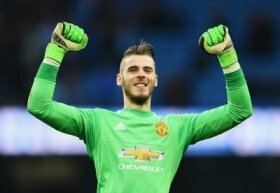 It is added that the shot-stopper is expected to become one of the club's highest earners behind only Alexis Sanchez with wages of around £375,000-a-week on offer with the extension. De Gea joined United from Atletico Madrid nearly eight years ago and during this period, he has amassed nearly 350 appearances while being named their player of the year in four of the previous seven seasons. The Spaniard's performances were hampered by a leaky backline during the early part of the campaign but that has recently been reverted since the turn of the year with four clean sheets in the league alone.